The Contemporary Series by Le Cache are clean, contemporary design blends equally well with modern, Craftsman, Deco or Asian décors. 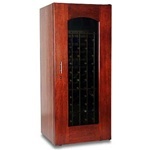 Hardwood doors and gently arched windows showcase fine wine collections. 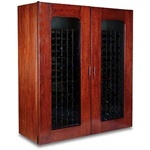 These wine cabinets feature high-quality construction, CellarPro cooling and the finest details. Long-term aging cabinets for maintaining ideal storage temperature between 55º to 58º F and relative humidity from 50% to 70%. 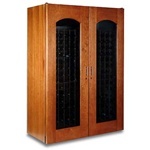 Finish Cherry exterior with Cherry interior and hand-crafted Redwood racks, which individually cradles up to 3½" bottles. Available from 172 to 622 bottles. Equipped CellarPro cooling system with digital temperature display and finger-tip controls. 2 year limited warranty on cabinetry and 5-yr on entire cooling system. Cabinetry manufactured overseas with final assembly in the USA. Cooling system manufactured in USA. Review the cabinet's dimensions to ensure that it will fit easily into your entrance doors at time of delivery. For consultation, call Toll Free at 877-447-8700, in Northern California at 925-447-8000, or e-mail us at info@winecabinets.com. Base price shown below are for base models, before any added options. CLICK ON IMAGE to view product descriptions and optional features. For your convenience, our helpful calculator totals your chosen options by clicking the Update Price button. LE CACHE Contemporary 1400 Arch Window Door shown in Classic Cherry finish. LE CACHE Contemporary 3-Dr Credenza shown in Provincial Cherry finish. LE CACHE Contemporary 3800 Arch Window Door shown in Provincial Cherry finish. LE CACHE Contemporary 5200 Tuscan Window Door shown in Classic Cherry finish.